It’s that time again! SharperIron is inviting anyone with writing talent to submit an article for our 3rd annual Writing Contest. This year, we’ll be selecting up to four winning articles and awarding each a spot on the front page as well as $75 (but you could win a good bit more! See below.) If you submit more than one article, you might even win more than once. Below, you’ll find the usual details, but first, note that a few things are different this year. Registered users can click the “like this” link on contest articles to give them votes. The “likes” count will be a factor (not the only factor) in choosing the winning submissions. All contest submissions this year will be tagged “2011 Contest,” so you’ll be able to view all the contest entries in one place by clicking here. To encourage writers to submit, we’re simultaneously running a “Chip-In” campaign. Donations to the campaign will be divided up among the winners, in addition to the $75 prize. A percentage may be divided among the non-winners as a consolation prize. The deadline for turning in an article for the contest is midnight, July 15. Articles should be about 1200 to 1700 words in length and not previously published. They may be on any topic. The topics below are of special interest and are a factor in evaluating winners, but not a major factor. We like surprises, too. Please include a brief bio with your submission and email it in .doc or .odt format to 2011contest@sharperiron.org. 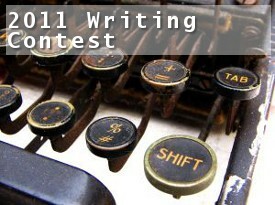 The contest is open to past writers as well as those who have never written for us before. The topic is completely up to you, but some suggestions follow. Readers: feel free to suggest additional topics or contest ideas in the thread! Researched: a bit of interaction with important published work on the topic is not required, but is a plus. Judging will be performed by the SI volunteers (editors, moderators, etc.) and maybe an uninvolved reader or two (if you’d like to volunteer, use the contact form to let us know of your interest). By submitting an article for the contest, you grant SharperIron the right to publish your article, whether or not it is one of the winners. Some may be published before the end of the contest period. We really wish we could compensate every writer, but will have to select a few that stand out. Please understand as well that not all contest entries will be used—though, judging from the last two years’ results, most of them will be.